Google takes a lot of time with its April Fools jokes, and they generally center around new products. Last year we saw the launch of Google Romance. This year, they have two solid fake product launches: Google TiSP (free broadband service) and Google Paper (Prints out Gmail on paper and sends it to you). In addition to TiSP and Paper, see Google Writer, a product invented by the Google Operating System blog that will handle most of the creative parts of writing for users. 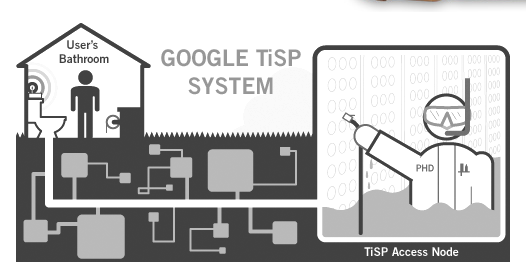 Google TiSP is a free, self installed free home wireless broadband service. This goes without saying, of course, but it operates via via fiber-optic cable strung through local municipal sewage lines. We use information gathered by discreet DNA sequencing of your personal bodily output to display online ads that are contextually relevant to your culinary preferences, current health status and likelihood of developing particular medical conditions going forward. Scatological references are always good for an easy laugh, at least in the U.S.
Google Paper is a new feature being promoted on the Gmail home page. You can request a physical copy of any email with the click of a button, and Google will deliver paper printouts to you in 2-4 days via the mail. Like TiSP, Google Paper is also free and advertising supported. In this case, the “relevant, targeted, unobtrusive advertisements” will appear on the back of printed emails “in red, bold, 36 pt Helvetica.” Nice. This is an excellent addition to Gmail in their race with Yahoo for the best webmail product. Gmail itself was actually launched on April 1, by the way.